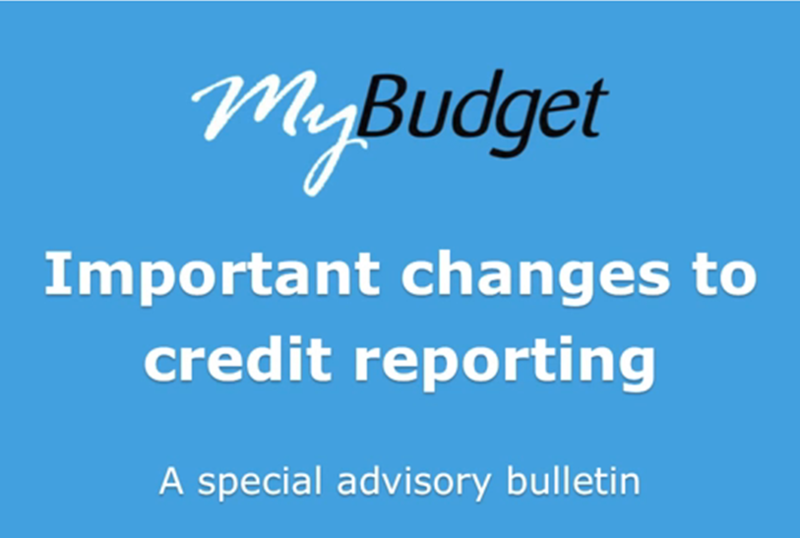 MyBudget would like to share this important update with you. Changes to privacy laws now allow credit reporting agencies to collect information about your repayment history on consumer credit payments. Although the new law will not be effective until March 2014, the data may be backdated as far as December 2012. The date your credit payments were due. Whether or not you made the payments by the due date (partial payments are considered missed payments). Does it mean that all late bill payments will appear in your credit file? No. 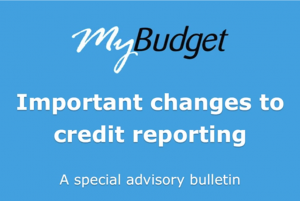 MyBudget has spoken with the Office of the Australian Information Commissioner (OAIC) and the Australian Securities and Investments Commission (ASIC), who have told us that the new laws only affect creditors that hold a credit licence. This means that your credit file will only include late payments for credit cards, store cards, charge cards, mortgages personal loans, and similar products. Creditors such as utility and telecommunication providers should be exempt. OAIC has also advised us that creditors will need to alert you before they start reporting the extra information. But, unfortunately, notifications from creditors about changes to privacy laws often arrive in the form of wordy letters that end up in the rubbish bin. We have been advised that the result of the information collected by credit reporting agencies will be used at the discretion of each lender based on their lending criteria at the time. The vast majority of MyBudget clients will not be affected. In fact, 93 per cent of payments processed by MyBudget are paid on or before the due date. For most clients it will be a bonus that their credit file will show that they reliably pay their bills on time. One of the many benefits of being a MyBudget client is that you can view your future payments online 24-hours-a-day, 7-days-a-week. The Future Payment Report shows all expected transactions into and out of your MyBudget account. If your expenses are forecasted to exceed your income, the Future Payment Report shows you which payments will be paid on time and, for payments that are not affordable, when they are expected to be paid. Our staff are also trained to discuss any shortfalls in your budget with you, giving you the best possible opportunity to act before any late payments actually occur. Late payments are generally caused by a change in your budget or a reduction in income. Occasionally, however, we also see instances where a client may opt to delay a payment — for example, to make an unbudgeted transfer from their MyBudget account. It’s important to remember that late payments on credit cards and loans may now appear on your credit file. This is something to keep in mind if you’re considering an unbudgeted withdrawal that will put a payment behind. MyBudget clients can check the Members’ Website. For members of the public, we've made a short video. There’s also a government fact sheet. As always, MyBudget is here to help.